Your purchase is a long-term investment in your health. Purchase from someone who is knowledgeable & available beyond the time you make a purchase. 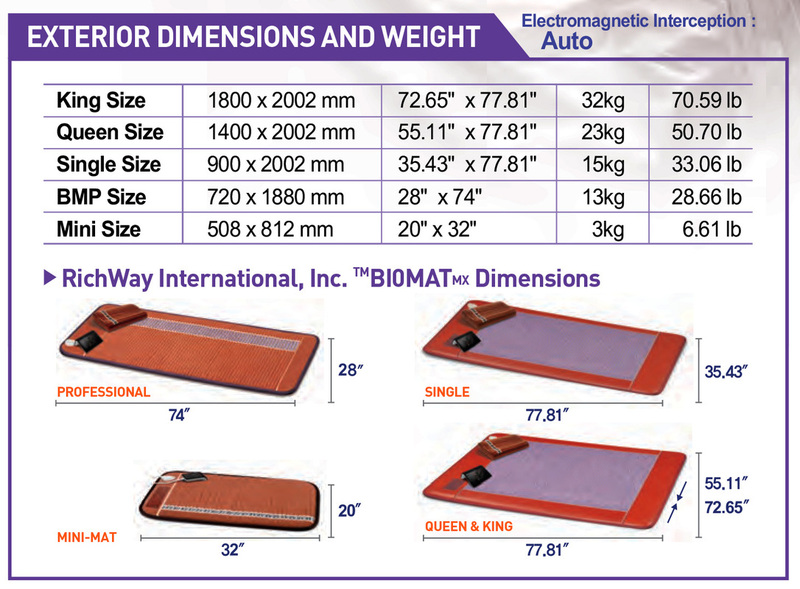 We have found that, invariably, questions come up - as the BioMat has a wide range of applications & effects. Our team excels in support, accessibility and knowledge! Are you looking for Health Maintenance versus Health Recovery? Ideally, each household can benefit from the Professional size BioMat and BioPillow (Pro set) as everyone is continuously bombarded with toxins and stress-ors. An investment in your health and your family's health. Moms have reported that the BioMat reduces the length of acute symptoms (cold & flu) and boosts the immune system naturally. Many have used it for acute injuries such as sprains and surgical wounds to speed up the healing process. Many college students are now taking a BioMat along with them & is considered as valuable an item as their laptop. Some children have favored the Mini BioMat over the larger Pro size (it's more 'their size). Struggling with a health issue or several imbalances? Used regularly, many health issues become part of the past, even those considered chronic. Professional Sized BioMat with BioPillow shown (Pro set). The Professional size is truly the smallest size you want to get for ANY reason. Telling you any different would be an injustice to you. The difference in benefits far outweighs the price difference. The Pro size fully accesses the entire body and lymphatic system. Crucial for best results. Approximately 30 pounds of amethyst quartz to help magnify all the healing properties of the BioMat. That much amethyst alone has a dramatic effect, even when turned "off" (no electricity)! Wheeled carrying case makes it easy to bring along on car trips. If you have a serious issue or concern, then any size less than this and you are cheating yourself out of a great recovery. Or at least prolonging the issue much longer than is necessary. Ideally use with the BioPillow whenever the BioMat is turned 'on', especially at mid to high temperatures. The Mini was designed as a travel piece for when the Pro size or larger mats would become too challenging to bring along. The Mini has since been used as an ACCESSORY piece for certain ideas like the 'sandwich method': to sandwich 'in' the person for deeper results. The Mini is also the only BioMat designed to bend to fit a chair for example. Many elderly & small children prefer this size because it is much more 'gentle'. Roughly 7 lbs. of Tourmaline stones and 7 lbs. of Amethyst. May get a car adapter (100W) from an electronics store and use in the car, preferably a passenger as we don't want you getting too relaxed on your drive; you need to be alert while driving. Ideally use with the BioPillow unless using in a chair or the car. Could you compare & contrast a Mini BioMat with a BIOBELT? 32" x 20" x 1"
Specifically creates crystal infrared frequencies for back issues. may move the belt in many directions over back, waist, leg etc. Crystal section is 18" x 8" x 1"
The Pro set (Professional size BioMat and BioPillow) lends itself to most professional settings. Therapists such as acupuncturists, chiropractors, massage & physical therapists along with energy healers report that the use of the BioMat alongside their own work often shortens client's recovery time. Spas often invest in the Pro Set and Mini to deliver the Spa level detox as a stand alone or in conjunction with other treatments. Used as an adjunct to cancer care, the Mini BioMat is recommended in addition to the Pro Set. This follows the 'Sandwich Method' explained in "The Fourth Treatment for Medical Refugees". The 'Sandwich Method' can also be used for Spa level detox in the privacy of your own home. from Mini to King size. This combination allows for maximum therapeutic effects of the BioMat. The Bio Pillow is sold separately. This is not a stand alone piece, it is an ACCESSORY. The Alkal Life Water Unit is a home unit for everyday use. The home unit is the mainstay product with Full Ionizing, alkalizing and FILTERING capabilities. The Alkal Life Home Unit creates ionized alkaline water from your sink and can be stored in your own containers for work, outings, etc.